A critical issue in computer simulation is quality of mesh refinement in object discretization. In an already published article “FAQ for the updated version of Frost 3D Universal software”, we discussed why such large computational meshes are important. In this article we analyze the quality of model discretization. 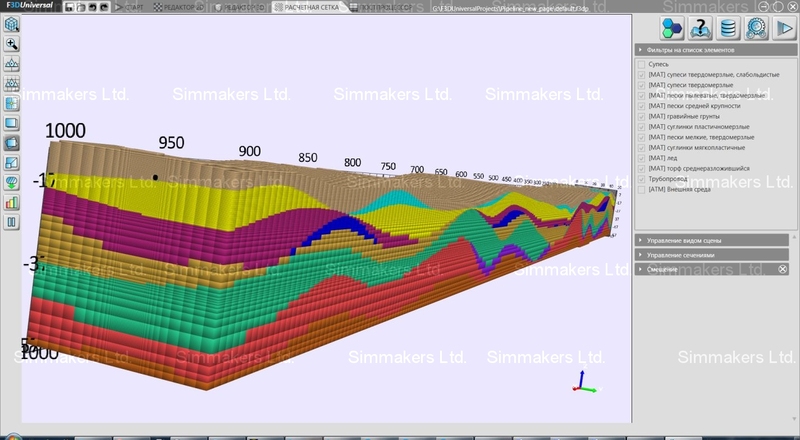 For our example, we used ice layers beneath a 1-km model of an oil pipeline on permafrost. The 3-D model was discretized into various cell quantities using different versions of Frost 3D Universal. Comparative analysis showed that the GPU version discretized the computational domain into 54.7 million nodes, clearly distinguishing the ice layer geometry and vastly reducing any inaccuracy in the thermal analysis. On the other hand, discretization of such a large site with the 32-bit program version almost completely lost the thin ice layer, which was in turn omitted in the computation.